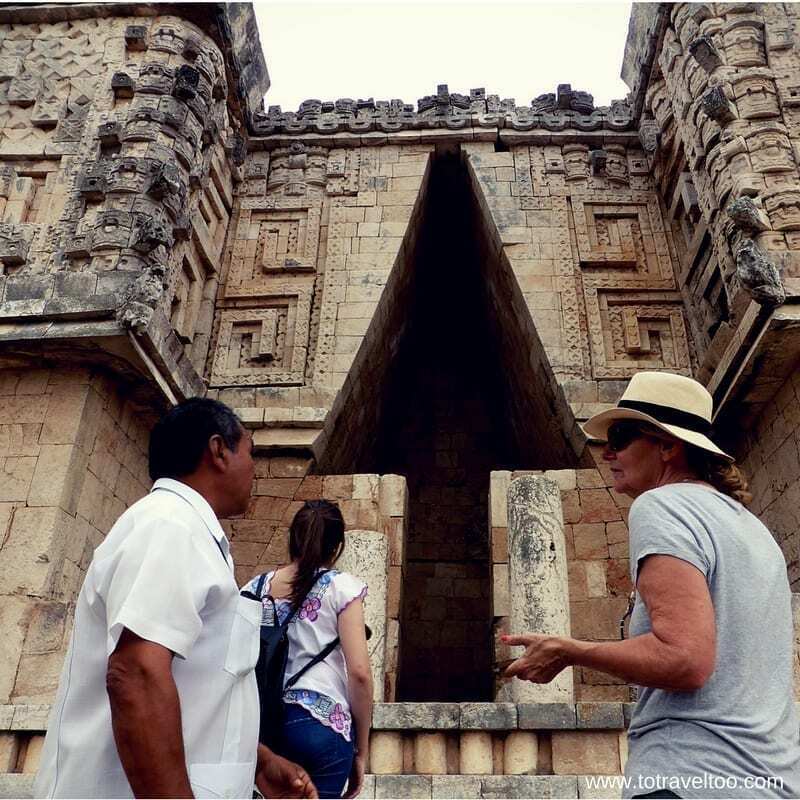 2 Our guide on what to do at Uxmal, Choco Museum, where to eat and where to stay. 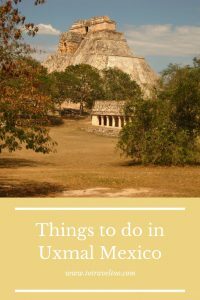 Our guide on what to do at Uxmal, Choco Museum, where to eat and where to stay. 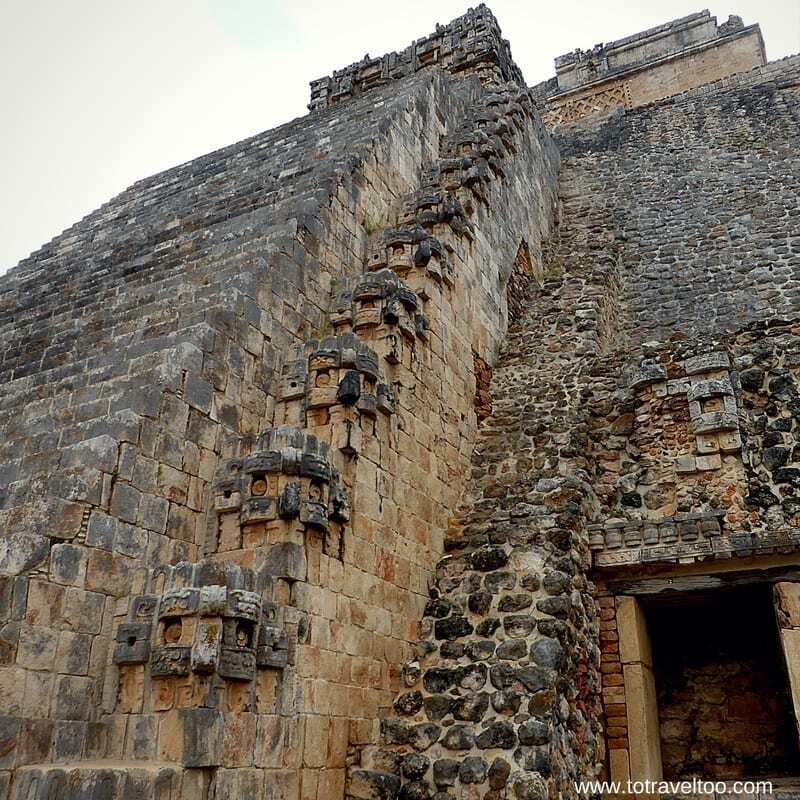 Uxmal in the Yucatan State of Mexico had always been on our bucket list. We had travelled to many regions around Mexico but had never quite made it, even when we were close by in Cancun and the Mayan Riviera. What was drawing us to this region? 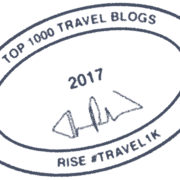 The Colonial towns of Merida and Izamal – the Yellow City, the Mayan Ruins of Chichen Itza and Uxmal as well as seeing Celestun and its pretty pink flamingos in the wild. A mix of colonial architecture, the best Mayan ruins and nature, what more could we want, except great Mexican food. We got that too! 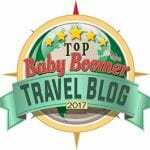 We have been so blown away with what we saw and experienced we will be back to visit some of the other towns we missed on our 4-day itinerary. 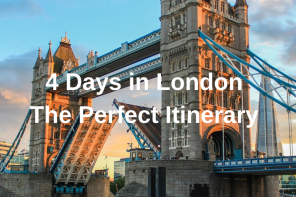 If you can spend longer in this region we would highly recommend it, even to suggest spending a week or more. 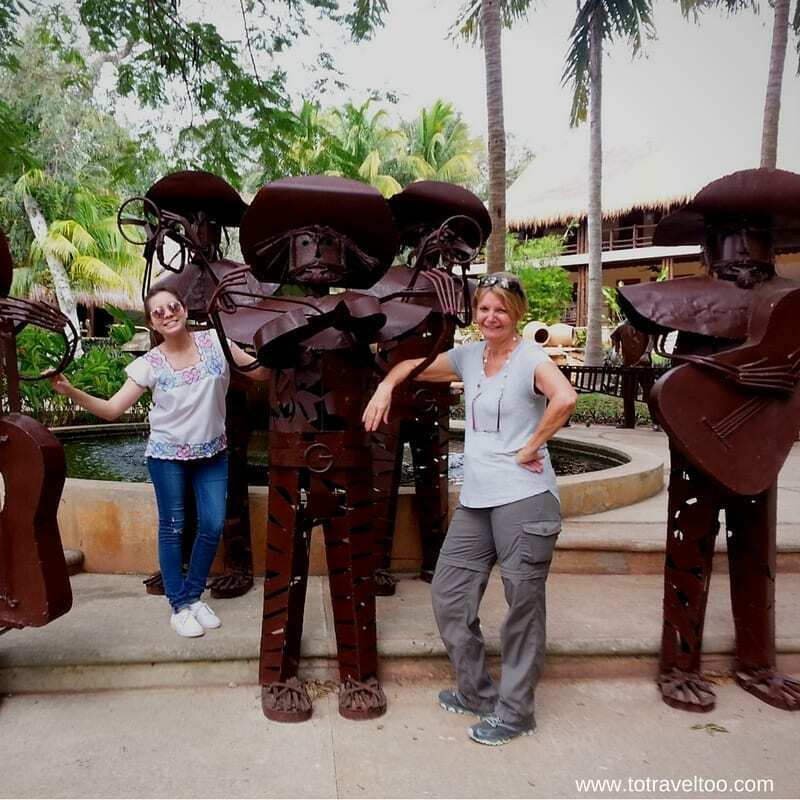 Mexico is one of our favourite countries and we have spent many months enjoying the people, culture, sights and we love mexican cuisine. 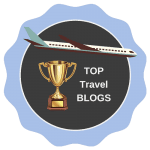 We have written an e-book – A Mexico Travel Guide with where to stay, eat, what to do and some great tips for you to plan your visit. The Yucatan Peninsula is located in the south-east of Mexico. The state of Campeche borders it to the southwest and Quintana Roo to the South East. The Gulf of Mexico borders the North Coast. If you are like us we like to read up on the Mayan ruins in Mexico before we visit. Uxmal The History of the Ancient Mayan City gave us insights into the Mayan people and the history of Uxmal, a city still shrouded in mystery. You can pre-purchase your entry ticket to Uxmal and the Choco Museum here, by purchasing in advance you can avoid the queues. We would recommend arriving at Uxmal when it opens at 8 am giving you the morning at leisure to wander around and enjoy the ruins without rushing it. Lunch can be enjoyed at The Lodge or one of the many local restaurants that are recommended on Tripadvisor. 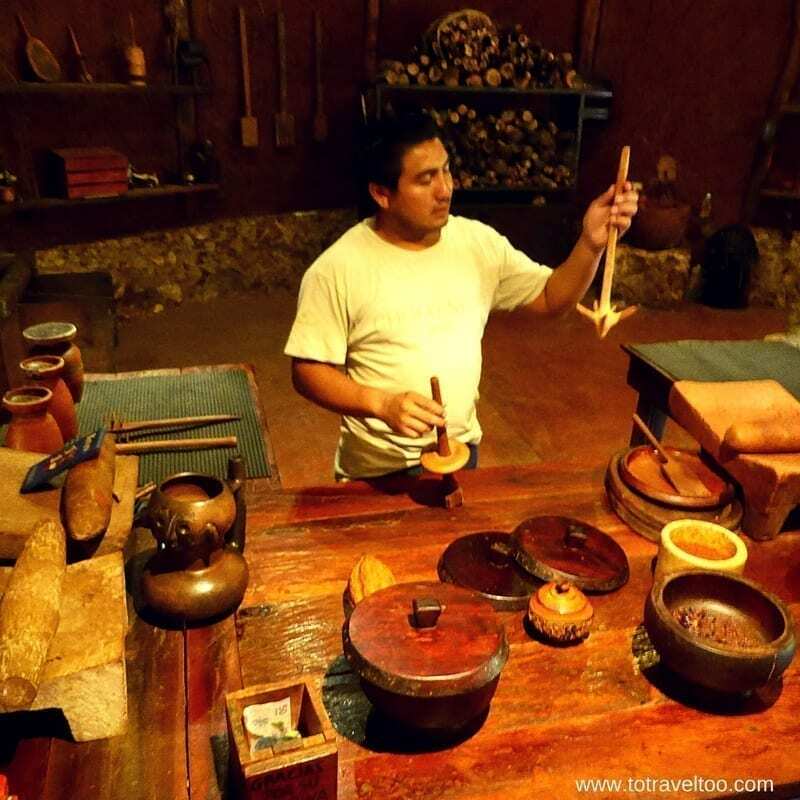 Visit the Choco-Story Museum at Uxmal. Stunning magical Uxmal in the Yucatan in Mexico! What a beauty you are! So much quieter to visit than your famous sister Chichen Itza. 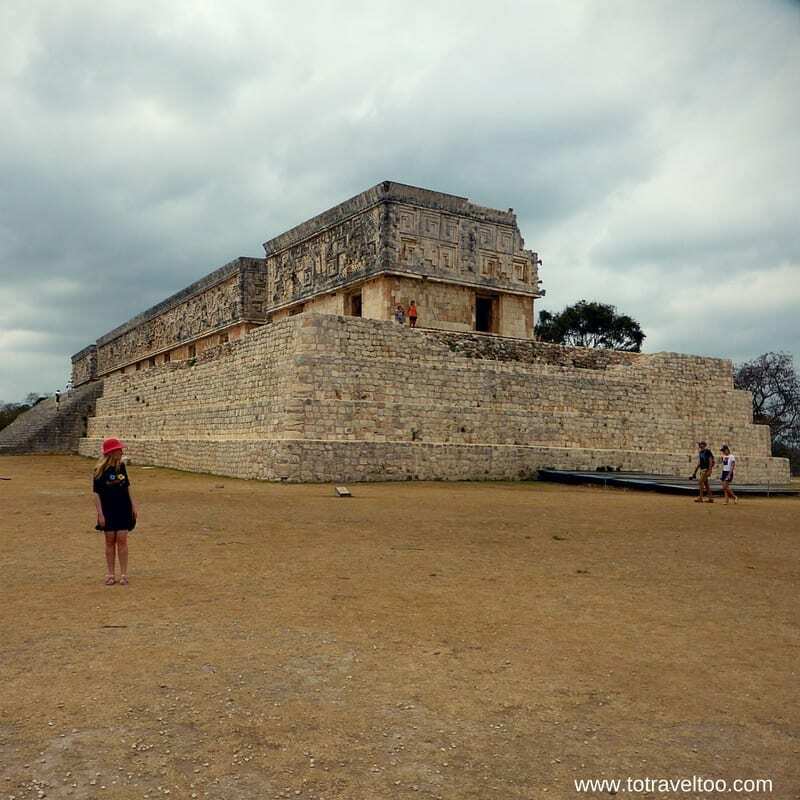 With so many Mayan ruins to visit in the Yucatan, we are not sure we have a favourite. Do you? The Maya are one of 5 civilisations from ancient Mexico. You could easily become ruined out if you try and cover them all in one go. In fact, we highly recommend you don’t. We did that in Asia with the temples in Thailand, Laos and Myanmar and after 2 months the last thing we wanted to visit was another temple. Some of you will know that feeling. 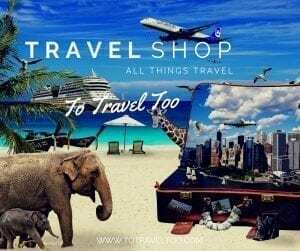 In Mexico, we have visited Teotihuacan, Tulum, Chichen Itza, Monte Alban and Palenque Ruins, not to mention Guatemala, Mexico’s neighbour and its spectacular Tikal. In our 4 day itinerary of the Yucatan, we even visited the smaller site of the Kinich Kakmo pyramid at Izamal, just 50 miles away from Merida. Uxmal pronounced ‘oosh-mahl’ which means built 3 times in Mayan is not so touristy as Chichen Itza. Why 3 times? It seems to suggest that for example that buildings were built over 3 times as was the Pyramid of the Magician. You should allow a couple of hours to visit Uxmal. 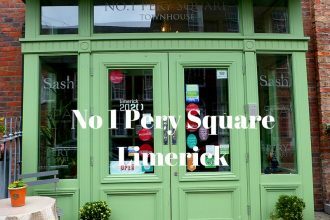 If you use the services of a local guide (which we highly recommend) the tour will take about 2 hours. Our guide was passionate about Uxmal, he could wax lyrically about each Rain God mask located on the temples, what to look for, why one was different in style to the other. 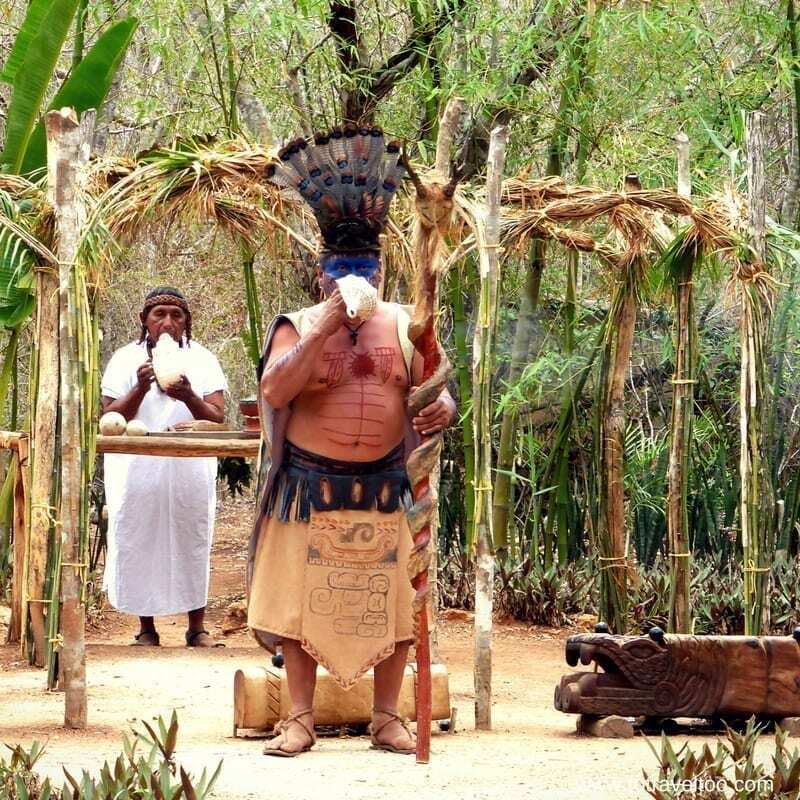 He told stories of life during this time, how they managed to get their water, their celebrations and their astronomical calculations for planting crops and worshiping Chac, the Rain God. For 2 hours he talked non-stop, even joking that his wife loves him doing this job. We asked him “why was it because of the money or his passion”, no he laughed, “she was fed up with his non-stop talking at home, and now he was so tired from talking so much during the day, she had peace and quiet at night now”. The Pyramid of the Magician is also known as the Pyramid of the Soothsayer and stands 35m tall and is the tallest structure in Uxmal. 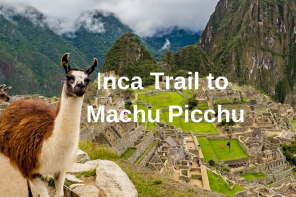 It certainly is impressive, and unusual as a pyramid as it has rounded sides, 60 degrees angle and 90 very steep steps that lead to the top. One can wonder whether the word pyramid is the right description here. If you are visiting on April 12th or August 13th you will note that the doorway at the top of the pyramid aligns with the setting sun. The Mayan Rulers were great astronomers and relied on the transitions of the Sun and in particular Venus to plan their crop planting and harvesting and for their celebrations. We love legends and no better than this one “Itzamna, a magician God supposedly built the Pyramid single handed in one night”. There is another similar legend – “the Pyramid is also known as the Pyramid of the Dwarf. Apparently, the Dwarf was hatched from an egg, grew to an adult in just one day and then constructed the pyramid single handed in one night.” We think we like the latter one! The Governor’s Palace was constructed around 987AD. Another unusual structure with a mosaic facade that reaches up to 320 feet in length. 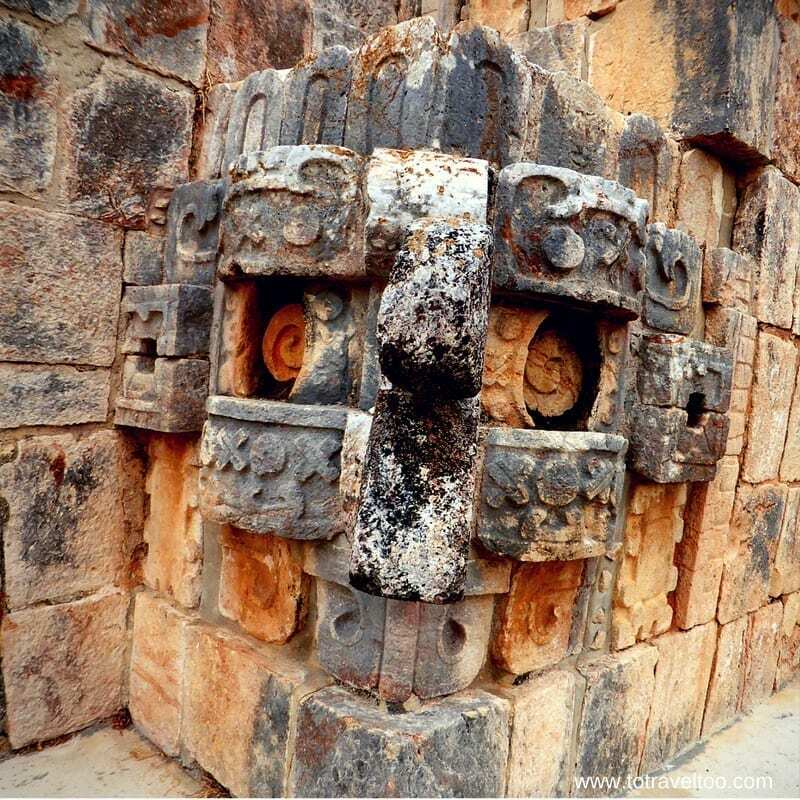 Their skilled stonemasons created masks in the shapes of gods, snakes, birds, and flowers. There are in fact on the East side of the structure 103 masks of Chac the Rain God. This is one structure that you can climb to the top, unlike Chichen Itza which has banned people. Researchers have discovered that the central doorway aligns with the planet, Venus. When looking at this photo we are still stunned at the carvings and how they have lasted over centuries with the ravages of the weather. 4 low-level buildings (North, South, East and West) joined at the sides are known as the Nunnery Quadrangle. Each was constructed at different times – the North first, followed by the South, East and the West. You must check the West building out – the impressive facade is made up of intertwining snakes and masks of the Rain God – Chac. The name Nunnery was given by explorers, researchers are unsure still what the building was used for. The Ball Court was built in 649AD. The Ball Court here is not as impressive as the one at Chichen Itza. The game played on both is the same as has been played throughout the centuries from North America to Nicaragua. There are 2 teams of 7 players. The Captain of each time is responsible for getting the heavy rubber ball into the ring that is situated on each side of the court without the use of hands only forearms, thighs and waist. The winner is the first one to put the ball through the hoop. The score will always be 1-0. Images show that the team players wore protective clothing made from leather, they would have needed it with the rubber ball weighing up to 4kg. Some games ended in human sacrifice. The Aztec people, another one of the 5 ancient civilisations of Mexico, played a similar game, called ōllamalitzli, the difference being this was played by the young nobles as a fun past time. You will find the Turtle House at the south end of the ball court next to the Palace of the Governor. Aptly named because the facade is made up of a frieze of turtles around the top of the small rectangular building. The story goes that turtles prayed to the Rain God Chac as they needed water to survive as did the Mayans. If you visit in May, watch where you walk, you will find tortoises all over the grounds. 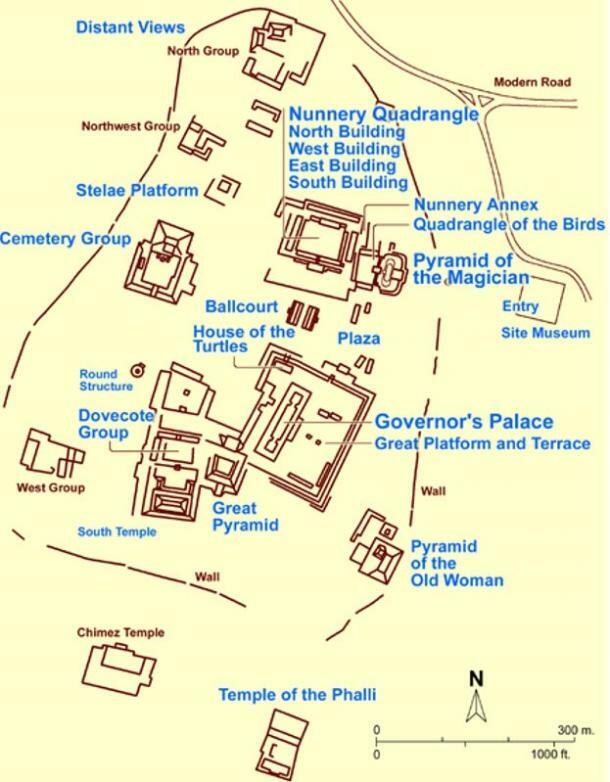 The Great Pyramid sits behind the Governor’s Palace with a height of 79m on each side. It is still only partially restored. 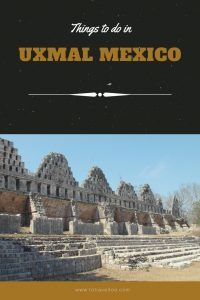 Researchers believe that before Uxmal was abandoned plans were made to build another structure over the Great Pyramid. Uxmal is different to Chichen Itza, Chichen Itza had cenotes to provide water whereas Uxmal collected rainwater in ‘cisterns’ for their people. It is a mystery why Uxmal was constructed in this location. Uxmal was one of the largest cities in the Yucatan region and was located in the Puuc region (Puuc means hilly country). Uxmal flourished between the 7th and 10th centuries AD, and during this time it was home to over 15,000 people. Uxmal was designated a UNESCO World Heritage Site in 1966. 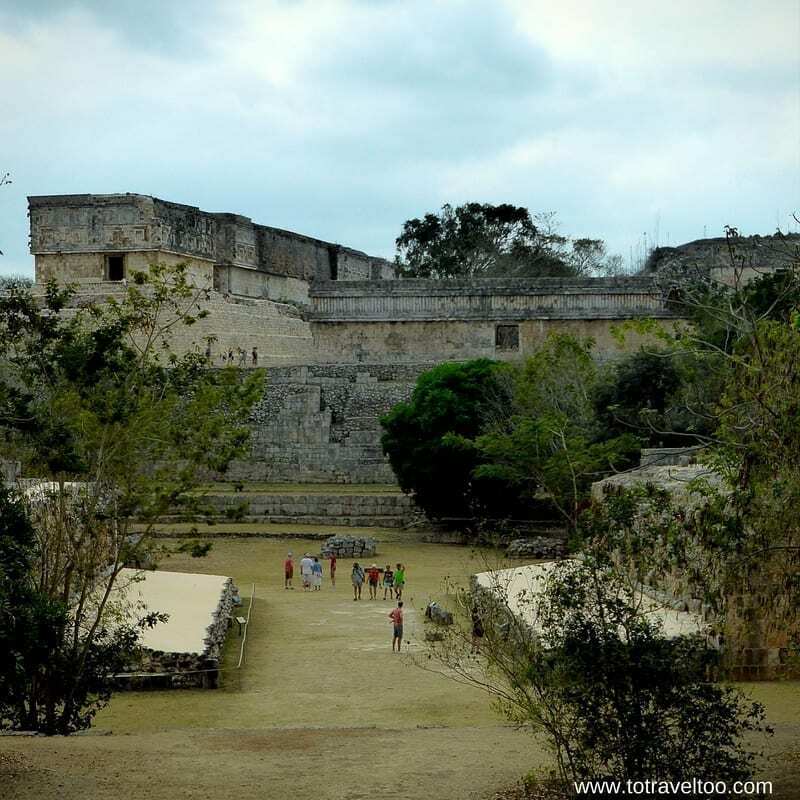 Uxmal is about 62km south of Merida, the drive from Merida takes approximately 1.5 hours. There are several bus services from Merida but we would recommend either hiring a car . The Lodge is well located at the entrance to Uxmal a few minutes walk away. It’s location in the tropical forest that surrounds Uxmal and the way it has been designed makes it a serene and peaceful place to either have lunch or stay in one of its private bungalows. 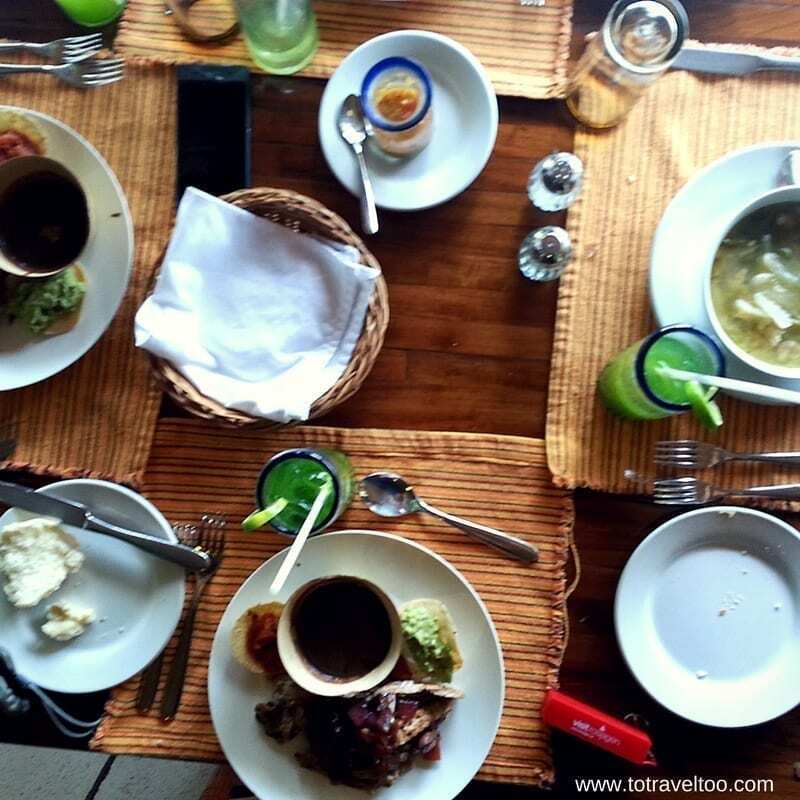 The thatched roof open-sided restaurant serves an a la carte international cuisine menu with local specialities of Mexican stews and Yucatecan dishes. A few minutes walk from the Lodge is the Choco-Story Museum. Do we love chocolate? Yep, sure do, doesn’t everyone. We were looking forward to the tour and of course the end where we hoped that we would have some complimentary chocolate to sample. What we can say is that if you are expecting a typical Museum this is not what you are going to get. 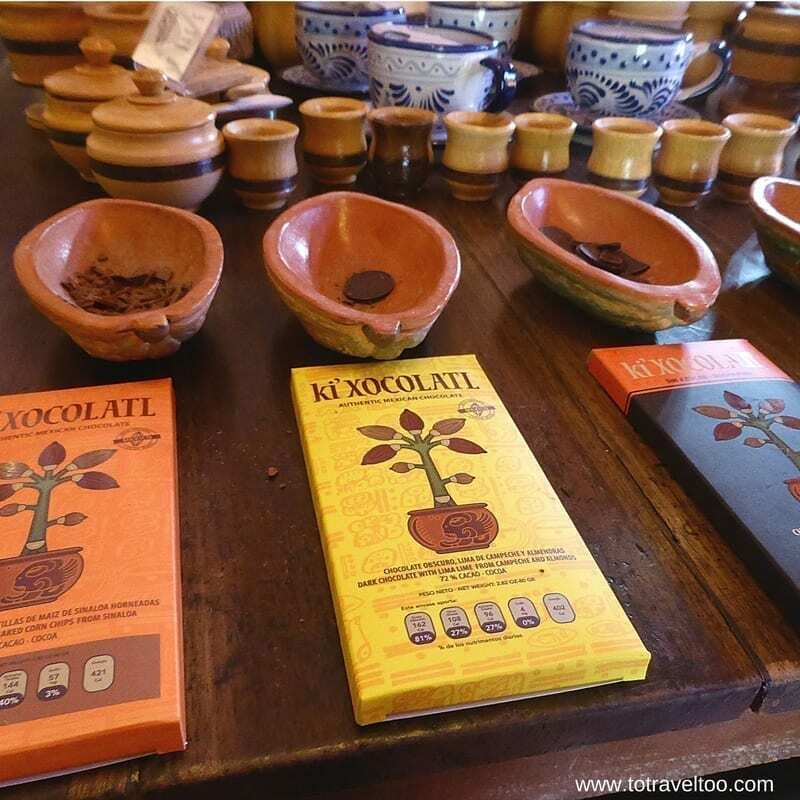 The history of chocolate comes later after you wander through a small botanical garden, a Mayan ceremony and a meet the animals at the fauna refuge of the Environmental Management Unit for Wildlife Conservation. You wander through a variety of small thatched huts that present the history of chocolate from the Americas to Europe to its present day. Displays highlight how chocolate was used in Mayan culture. We learned how cacao was given to the Mayans by the feathered serpent Quetzalcóatl. When cacao was made into a beverage it was drunk by royalty and the aristocracy for ceremonies and festivities such as birth, death, marriage and entry to puberty. Cacao beans were also used as currency e.g. 1 rabbit = 10 beans and for 1 healthy slave 100 beans. The last thatched hut gave us the opportunity to taste the cacao beverage that was being brewed. If that was our first experience of hot chocolate we would have certainly stayed with our preferred beverage – coffee. Even with a lot of added sugar it tasted like soil and was bitter. What chocolate would you choose? When can we taste some chocolate? You could see the looks on others faces after their hot chocolate tasting and knew that they were in search of something sweet. At the entrance is the gift shop and on the middle table is about 8 different samples of chocolates that you can buy. Our favourite – chilli chocolate. Disability Access: The buildings had ramped entrances for easy access. 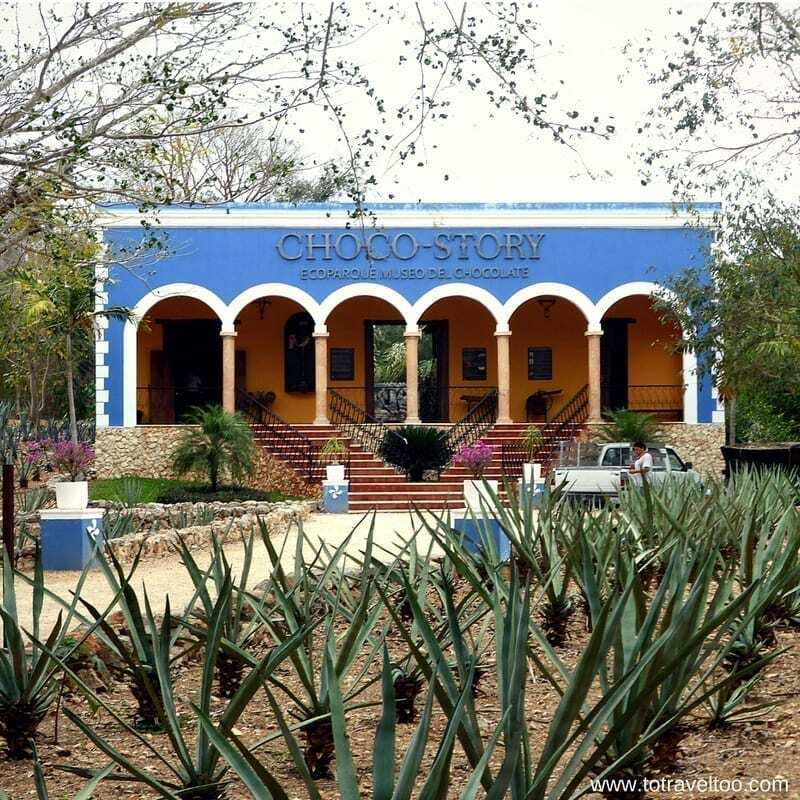 The Choco-Story is #2 tourist site in Uxmal. One of the best ways to enjoy a Mayan site is to stay in a hotel that is close by. In hindsight, when we visited the ancient site of Palenque in Mexico we chose to stay in the town itself, there was not much around and in fact staying within walking distance to Palenque Ruins would have given us more time to enjoy the site. In the end, it comes down to what time you have available and what other sites or attractions you are also visiting. 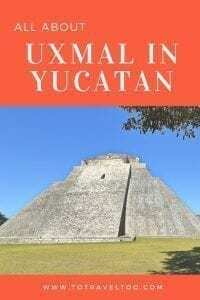 We give you some suggestions on where to stay around Uxmal. 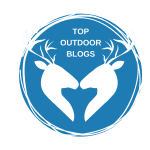 We chose to stay at the Wyndham at Merida because we had 4 days to spend in the Yucatan region and it was centrally located for what we needed to do. 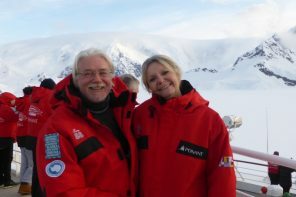 We thank them for their hospitality during our sponsored stay. A perfectly located hotel in Merida, comfortable rooms with a swimming pool which was ideal after a day of sightseeing. There are a variety of Airbnb properties in and around Uxmal. A list of airports on the Yucatan Peninsula. For the latest on cheap airfares click here. 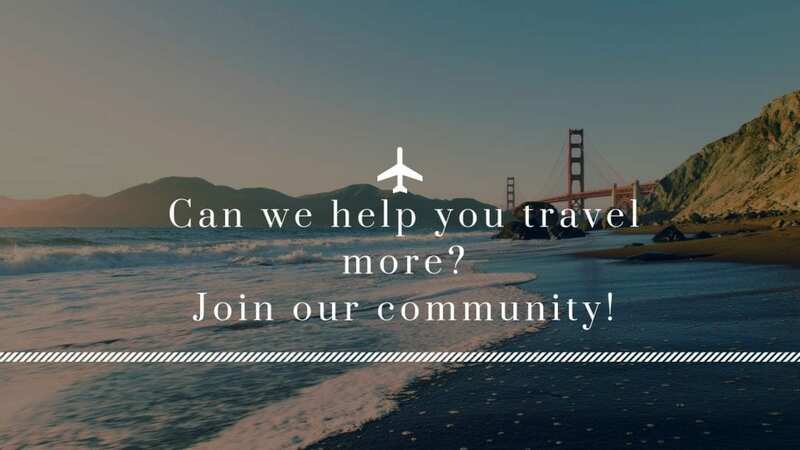 We recommend that you take out travel insurance when you book your flights and accommodation. 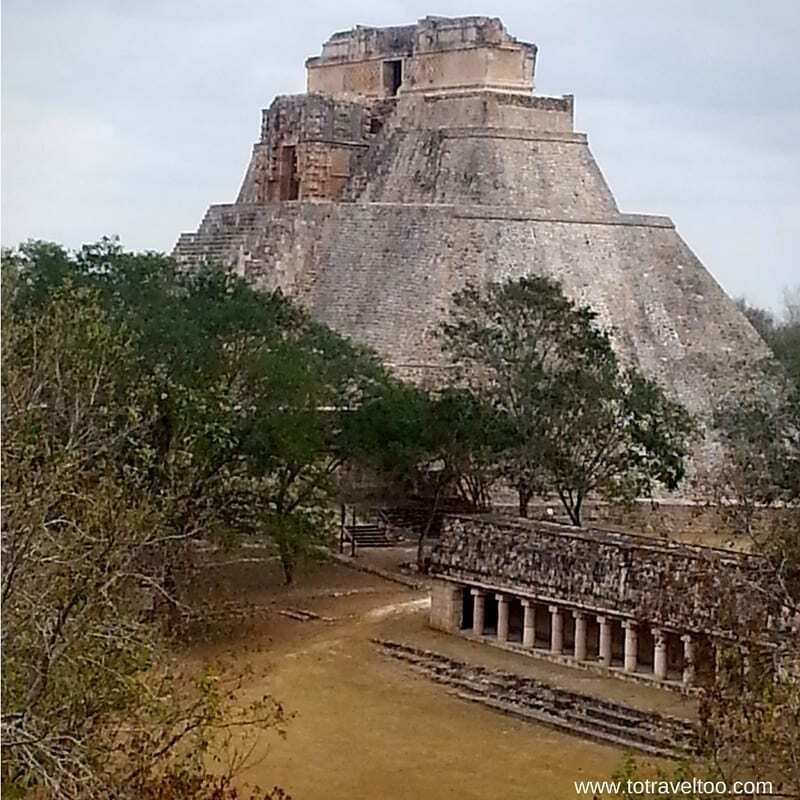 Disclosure: We enjoyed our visit to Uxmal as guests of Visit Mexico and Yucatan Turismo but received no further remuneration to write this post. As usual, our opinions are of our own. Wow this trip sounded awesome! I am a huge fan of different ruins, so would love to visit this one, especially since its not as touristy as you mentioned. I also really love chocolate, so it would be interesting to hear the back story from the Mayans and to try the Cacao beverage. Thanks for your comments. Hope you can visit one day and see the ruins and enjoy the chocolate. 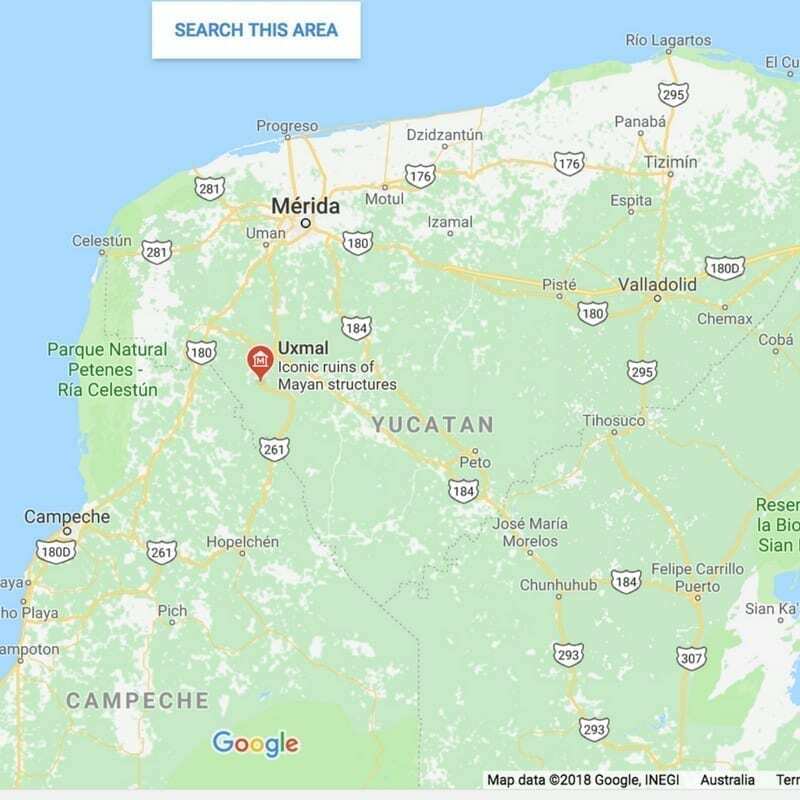 I am not really familiar with the South-east parts of Mexico but after reading your post, I am now interested to visit. The Pyramids of the Magician is fascinating. Hoping to get a chance to visit in the future. Thanks for your comments. 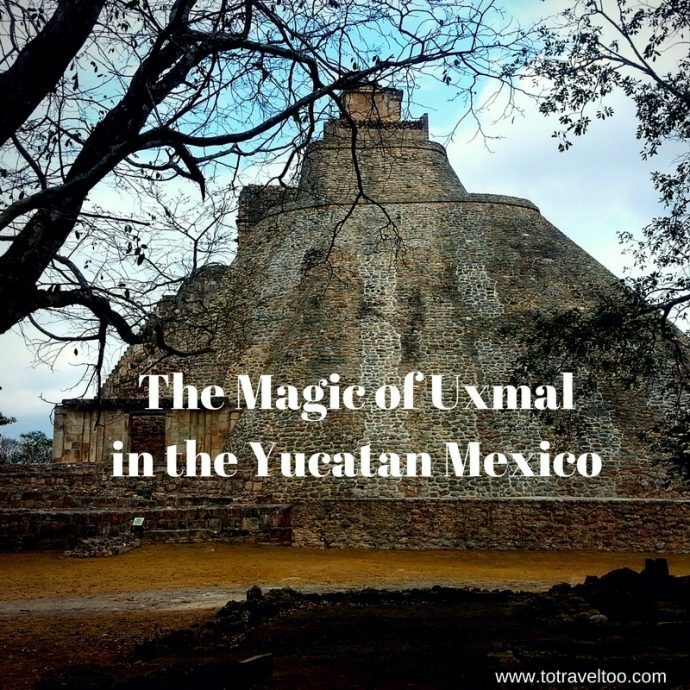 Hope you can get to visit Uxmal one day. These photos are so beautiful. I had no idea this region is so picturesque. I’d love to see the pyramid in person. Is this a family-friendly area? Thanks for your comments. Uxmal is family friendly, just make sure you all have plenty of water and sunscreen. Uxmal looks like a beautiful place to visit! Mayan ruins are always beautiful. The Governor’s Palace looks especially interesting. I would love to go there and learn all the history! Thanks for your comments. Uxmal is a great place to visit. I would highly recommend hiring a guide to learn the history. Thanks for such a detailed post. It’s a part of the world that I have not yet explored, and thus, reading about it is always fascinating. Love how there is so much historical significance here, and as a foodie, the Choco-Story is one place I now long to visit. Thank you. Thanks for your comments. Choco Story is a fun place to visit make sure you taste the chilli chocolate. Mexico is such a unique country. Thanks for your comments. Sorry to hear that you had to cancel your trip. Hope you can make it, don’t forget to try the chilli chocolate! 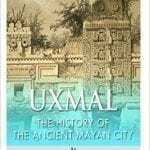 I’m so gutted I missed visiting Uxmal when I was in Yucatan. The structures are impressive, and in incredible condition given how old they are. I’d love to come in May to see the tortoises at the house of the turtles, it’s a good thing it’s not just the name. An incredible part of Mexico. Thanks for your comments. 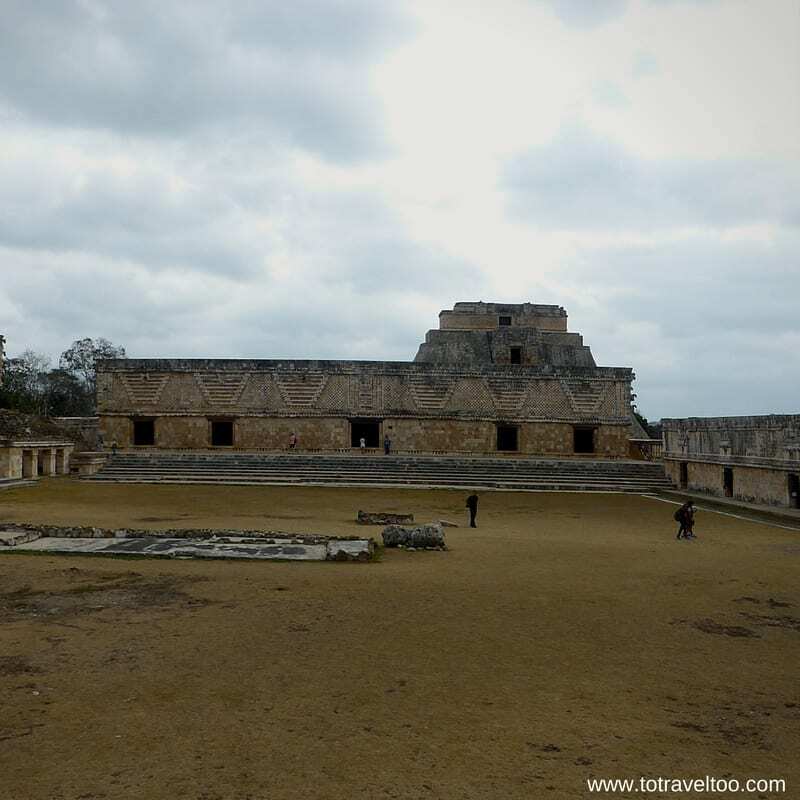 Uxmal is an amazing destination, I enjoy wandering around the Mayan sites. You would too! 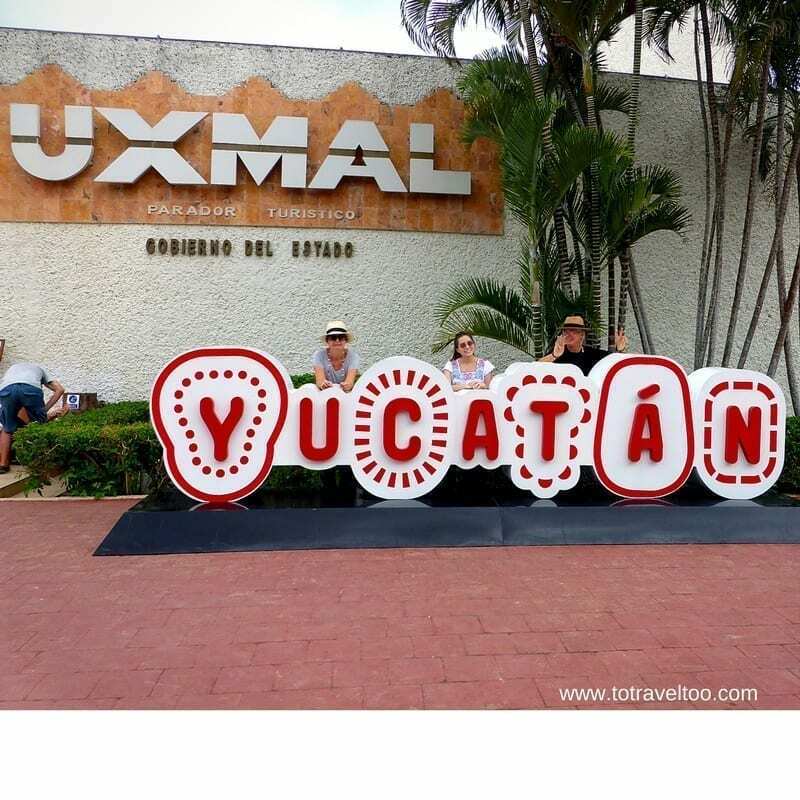 We spent a bit of time in Yucatán a few years ago but unfortunately we didn’t make it to Uxmal – looks like we need to go back! Thanks for such a thoroughly researched and detailed post. I think hiring a guide in places like this is always a good idea to get a better understanding of their story. Thanks for your comments. A guide is definitely the way to go to learn more about what you are seeing. Uxmal is beautiful. Mexico is high on my wishlist but I never know many worth visiting places from Mexico. It is great that you shared Uxmal which I found very interesting due to ancient pyramids and unique culture. Thanks for sharing the necessary details. Thanks for your comments. Uxmal is magic and well worth a visit if you are travelling to Mexico.